Losing weight is never fun and for most of us, it’s not easy – especially as we get older. The good news is after 25 years of consulting, I have a great “blue-print” for losing stubborn fat … and that’s what I’m going to share with you today. Losing weight is difficult as it is, but it’s an even bigger challenge after you’ve had a Thyroidectomy – which is a removal of your thyroid gland. And the reason is due to a slower metabolism because of a change in hormones. In fact, both my dad and my aunt have had a thyroidectomy, so I’m very familiar with what happens during and after, so I can surely help you today. Whether you’ve had a partial or full thyroidectomy, most likely you’ll need to be on thyroid replacement medication. The main difference with a partial thyroidectomy is you sill have SOME of your thyroid gland and thus, you’ll need a lower dose of thyroid medication. Now, the main problem is that most doctors only prescribe T4 thyroid and that’s usually not enough to boost your metabolism. A better approach would be to ALSO take T3 thyroid, combined with T4 – which is a more natural combination. In fact, T3 thyroid is the ACTIVE hormone which does all the fat burning and controls your metabolism. The problem with taking only T4 thyroid is that your life-style (diet, exercise, stress level, etc.) can influence how much T4, converts to the active T3. And the less conversion to T3, the slower your metabolism and the harder it is to lose weight. As you can see, hormones really do control everything. Throw in aging and stress… and now things get a bit more challenging. So today I’m going to give you some great suggestions which will help improve your thyroid conversion to the active T3 and maximize your fat loss. But we’ll ALSO be optimizing your other fat burning hormones – which means a faster metabolism, more energy and healthier fat loss – especially in those stubborn fat areas. So, don’t worry – it’s not your fault. There is hope, I’ve got the solution and you CAN do it! NO Drugs – Even though there are specific drugs you can take that’ll speed up the fat loss, unfortunately they’re loaded with side-effects and later, you’ll eventually gain all the weight back when you get off of the drug. But, don’t worry… I’ll show you an all-natural solution that works great, without the drug side-effects. NO “Weight Loss” – The other thing is you want to lose FAT, not just “weight”, which is usually valuable muscle loss. Unfortunately, most weight loss programs cause the wrong type of weight loss. Today I’ll show you how to decrease the inches in those stubborn areas like your belly, arms, hips and legs for the ladies. There are really 3 main keys to healthy, long-term fat loss and I’m going to simplify it for you. Diet – this is the most important, since you can easily consume more calories than you can burn. Exercise – by doing the right form of exercise you’ll burn more calories, which will allow you to eat more food or not diet as hard. Supplements – the right kind will improve your “fat burning genes” by up-regulating key fat burning hormones, which means faster fat loss. The most important aspect of fat loss is your diet because you can easily consume MORE calories than you can burn. It’s just so easy and that’s why we have to watch what you eat. So, here are a few “fast result” diet tips. Let’s first start with the things you should NOT do because these will quickly sabotage any weight loss goals you’ll ever have. I started with the hardest one, but that’s because most carbohydrates (grains, breads, pastas, rice, etc.) are very calorie dense and make you retain lots of water weight. Another major problem is that they easily convert to fat due to the high blood sugar response. IF you’re going to have them, do so only after an exercise session. This is easier for most people, but don’t consume any sauces, syrups, salad dressings, etc. Too calorie dense and either loaded with sugar and/or fats. Instead, have lemon juice and vinegar on your salad. Okay, I know I just told you not to, but carbs are very good for your metabolism because they improve your thyroid production. You just need to eat the right kinds and that’s primarily from unlimited vegetables, some fruits, legumes and occasionally some sweet potatoes if you want a “treat”. Unlimited water and green tea. Mix in lemon juice and sweeten with natural Stevia and you have a great tasting and healthy drink that will also curb your appetite. You should have some protein, but limit it to fish, chicken and lean meats. No more than 4 oz daily and do NOT fry the meats or cook with oils. The second most important formula for fat loss success is exercise. Ideally you should do BOTH aerobic AND anaerobic exercise. This means cardiovascular – like walking, running, treadmill, etc. And also lifting weights to increase muscle mass – using free weights, machines and cables. In fact, the weight lifting is more important for FAT loss because the extra muscle burns fat all day long and helps give shape to your body. You may lose less “weight” on the scale because of the extra muscle size, but you’ll lose more UGLY FAT in those stubborn areas, which matters most. Anyway, just try to do something daily. For faster results, try exercising 2x daily. For example, you can walk in the morning for 20-30 minutes and do weights in the afternoon for 20-30 minutes. This is the BEST case scenario… I wouldn’t expect you to start here, unless you’re super motivated or you want faster results. But just try to do a minimum of 20-30 minutes, 3x weekly of any form of exercise to begin with. This is exactly why my private clients and over half a million people for over 15 years have all utilize Lean Optimizer™ because it helps optimize your fat-burning “youth” hormones. We all know of people who can eat whatever they want, not exercise and they don’t really gain much weight. This has to do with genetics and hormones. This is why when women are menstruating or they’re menopausal, they gain weight – in all the wrong places – HORMONES. 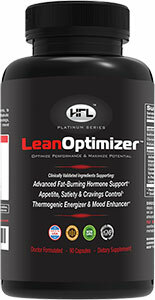 Lean Optimizer™ helps improve your fat burning hormones and enzymes, naturally. You need to eat better and exercise daily – these should be your primary goals. By utilizing Lean Optimizer with the right diet and exercise program, means improved and healthier fat loss, for long-term results. One major reason Lean Optimizer™ is better than other options is because it’s doctor formulated and scientifically tested to work. The feedback has been is really great and since the product has been around for over 15 years, you know it works! Anyways, there’s a free video about how Lean Optimizer™ works and how you’ll benefit. You can also view the clinical studies of ingredients, customer reviews, FAQ’s, etc… Take a look and let me know what you think and email me your results!